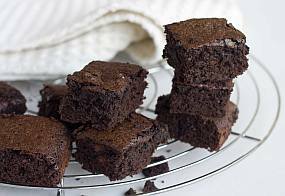 Chocolate Brownies, classic American dessert recipe. Melt the chocolate over low heat, stirring continually. Do not let it boil. Cool. Mix the butter and sugar until the mixture is light and airy. Beat in the eggs and then the melted chocolate. Add the flour, baking powder and salt until all items are combined. Stir in the vanilla and pieces of walnut. Pour in the batter and evenly spread in the pan. Bake in the middle of the oven for 30 minutes. Cool the brownies for about 10 minutes. Finally, cut the brownie into 2-inch squares and place on a cooling rack.